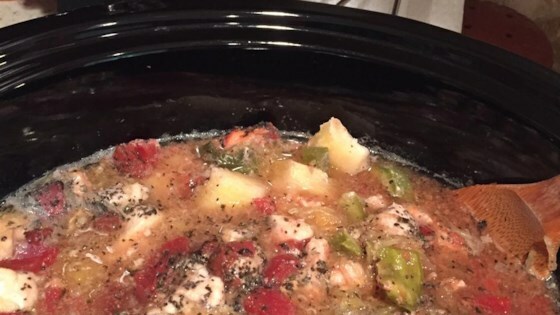 "This slow cooker recipe mixes chicken, spaghetti squash, diced tomatoes, and bell pepper for an easy soup preparation." Stir spaghetti squash, tomatoes, chicken broth, chicken, bell pepper, salt, sugar, parsley, basil, oregano, garlic powder, and onion powder together in a slow cooker. You can use 1 teaspoon minced fresh garlic in place of the garlic powder. If you want more garlic flavor, replace the salt with garlic salt. Great recipe - added more chicken stock as others had written and more herbs. Added some bloody mary mix in to give it a kick.